The cliché of the struggling artist isn't just about the financial aspect; sometimes it's the entire process, from the beginning of an idea to when you sign your name to a piece. I find myself, once again, struggling. 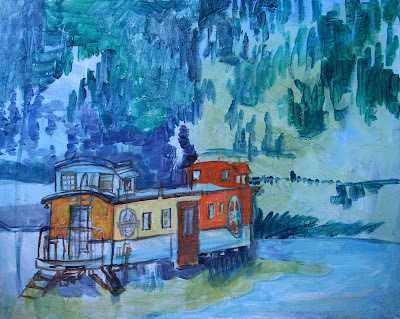 Whether consciously or unconsciously, I've been tackling subjects outside my normal realm. And that's a good thing really, because it helps me grow as an artist. It seems whenever you head into uncharted territory, there is a struggle. But learning something new can be a giant pain in the backside. In my mind, if I'm hating an activity, I'm probably learning something. When I looked through my images for inspiration, I was drawn to photos from our belated honeymoon we took last fall—particularly, one image that was taken in New Mexico. We were on the Navaho Reservation—the only car on a side road that revealed open expanses of duff and mud browns, golden grasses, and streaks of rust. There were low red mesas and scattered ink splatters of dark gray-green junipers. There was an occasional sun-bleached trailer encircled by cars and other signs of life: a few sheep, a barking dog, rusty bicycles, or bright patches of clothes on a line. My camera caught a pale horse running into the sun. It was beautiful. As my eyes returned to the road, I saw two young Navaho boys walking along the shoulder dressed like gang bangers, oozing attitude. They flashed gang signs. It was such a weird and sad contrast to the horses running into the light. 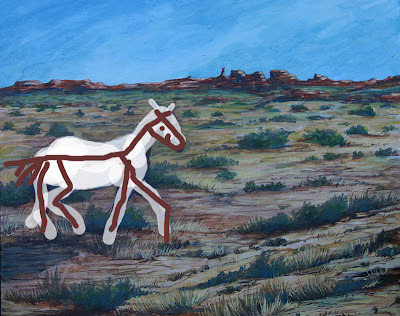 Fast forward to a week ago, when I decided to paint the image of the horse. I don't recall that I've drawn a horse since I was about twelve—and then, they were the cartoon-like pretty ponies of adolescence. And so, I drew and drew and drew, using a book on drawing animals for reference, until I came up with a pretty good rendering of the horse. The painting started out well, the gestural quality of the animal held through the under painting process. But now, I'm at a stalling point. Something was lost in that last session, and I was about to paint a giant red X over it in frustration. What happened between the drawings and the application of the paint? I wish I could describe the challenge of transitioning from drawing to painting. With some subjects, I know exactly where I'm going—with others—not so much. 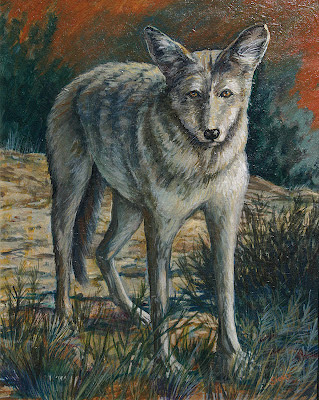 This painting problem reminds me of Trickster, the coyote that did NOT want his image captured in paint. I must have repainted him ten times after studying and painting and redrawing and painting and studying and...well, you get the idea. In the end, though, it was worth it. Will I have success with the spirit of the horse? It is running away from me. Will I capture it, or merely struggle for a long while? This remains to be seen. While this painting simmers, I’ve begun work on another subject, which again, is outside the box I've painted myself into in recent years. It’s an old rail car someone turned into a home, picturesquely sitting on the outskirts of Silverton, Colorado. Stay tuned. While I stretch my artistic legs I might get a blister or two along the way.